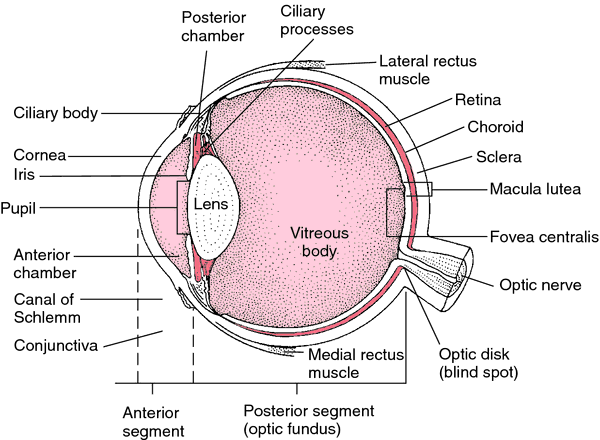 the organ of vision; see also Plates. In the embryo the eye develops as a direct extension of the brain, and thus is a very delicate organ. To protect the eye the bones of the skull are shaped so that an orbital cavity protects the dorsal aspect of each eyeball. In addition, the conjunctival sac covers the front of the eyeball and lines the upper and lower eyelids. Tears from the lacrimal duct constantly wash the eye to remove foreign objects, and the lids and eyelashes help protect the front of the eye. Structure. The eyeball has three coats. The cornea is the clear transparent layer on the front of the eyeball; it is a continuation of the sclera (the white of the eye), the tough outer coat that helps protect the delicate mechanism of the eye. The choroid is the middle layer and contains blood vessels. The third layer, the retina, contains rods and cones, which are specialized cells that are sensitive to light. Behind the cornea and in front of the lens is the iris, the circular pigmented band around the pupil. The iris works much like the diaphragm in a camera, widening or narrowing the pupil to adjust to different light conditions. Because the eye must function under many different circumstances, there are two types of nerve cells in the retina, with different shapes: the cones and the rods. They cover the full range of adaptation to light, the cones being sensitive in bright light, and the rods in dim light. The cones are responsible for color vision. There are three types of cones, each containing a substance that reacts to light of a different color, one set for red, one for green, and one for violet. These are the primary colors in light, which, when mixed together, give white. White light stimulates all three sets of color cells; any other color stimulates one or two. The optic nerve, which transmits the nerve impulses from the retina to the visual center of the brain, contains nerve fibers from the many nerve cells in the retina. The small spot where it leaves the retina does not have any light-sensitive cells, and is called the blind spot. The eyes are situated in the front of the head in such a way that human beings have stereoscopic vision, the ability to judge distances. Because the eyes are set apart, each eye sees farther around an object on its own side than does the other. The brain superimposes the two slightly different images and judges distances from the composite image. Foreign bodies in the eyes are common occurrences. Protective eyewear should be worn by individuals at risk. Cinders, grit, or other foreign bodies are best removed by lifting the eyelid by the lashes. The foreign body will usually remain on the surface of the lid, and can easily be removed. Particles embedded in the eyeball must be removed by a qualified health care professional. Eyestrain is fatigue of the eyes caused by improper use, uncorrected defects in the vision, or an eye disorder. Symptoms may include aching or pains in the eyes, or a hot, scratchy feeling in the eyelids. Headache, blurring or dimness of vision, and sometimes dizziness or nausea may also occur. Anatomic features of the eye. From Ignatavicius and Workman, 2002. Cleaning of a prosthetic eye is similar in principle to care of dentures; both are handled with care to avoid damage and are cleansed according to good hygienic principles. The prosthesis is removed while the patient is lying down so that it falls into the hand and is not likely to be dropped and broken. It is removed by depressing the lower eyelid, allowing the prosthesis to slide out and down. Mild soap and water are most often used for cleansing the prosthesis. Alcohol or other chemicals can damage prostheses made of plastic. If it is not replaced in the socket immediately after cleansing, it is stored in water or contact lens soaking solution. Insertion of the prosthesis is done by lifting the upper eyelid with the thumb or forefinger and placing its notched edge toward the nose. It is placed as far as possible under the upper lid and then the lower lid is depressed to allow it to slip into place. The process can be made easier by first moistening the prosthesis with water. If it is necessary to wipe the eye area of a patient wearing a prosthesis, one should gently wipe toward the nose in order not to dislodge the prosthesis. pink eye popular term for acute contagious conjunctivitis. raccoon e's ecchymotic areas surrounding both eyes, suggestive of a basilar skull fracture. 2. 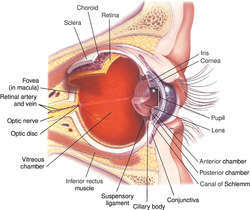 The area of the eye, including lids and other accessory organs of the eye; the contents of the orbit (common). (i) the organ of vision. black eye a bruise of the tissue around the eye, marked by discoloration, swelling, and pain. exciting eye the eye that is primarily injured and from which the influences start which involve the other eye in sympathetic ophthalmia. Klieg eye conjunctivitis, edema of the eyelids, lacrimation, and photophobia due to exposure to intense lights (Klieg lights). pink eye acute contagious conjunctivitis. 1. leukoma of the cornea. 2. Either of a pair of hollow structures located in bony sockets of the skull, functioning together or independently, each having a lens capable of focusing incident light on an internal photosensitive retina from which nerve impulses are sent to the brain; the vertebrate organ of vision. 3. The external, visible portion of this organ together with its associated structures, especially the eyelids, eyelashes, and eyebrows. 4. The pigmented iris of this organ. one of a pair of organs of sight, contained in a bony orbit at the front of the skull, with retrobulbar fat, and innervated by four cranial nerves: optic, oculomotor, trochlear, and abducens. Associated with the eye are certain accessory structures, such as the muscles, the fasciae, the eyebrow, the eyelids, the conjunctiva, and the lacrimal gland. The bulb of the eye is composed of segments of two spheres with nearly parallel axes that constitute the outside tunic and one of three fibrous layers enclosing two internal cavities separated by the crystalline lens. The smaller cavity anterior to the lens is divided by the iris into two chambers, both filled with aqueous humor. The posterior cavity is larger than the anterior cavity and contains the jellylike vitreous body that is divided by the hyaloid canal. The outside tunic of the bulb consists of the transparent cornea anteriorly, constituting one fifth of the tunic, and the opaque sclera posteriorly, constituting five sixths of the tunic. The intermediate vascular, pigmented tunic consists of the choroid, the ciliary body, and the iris. The internal tunic of nervous tissue is the retina. Light waves passing through the lens strike a layer of rods and cones in the retina, creating impulses that are transmitted by the optic nerve to the brain. The transverse and the anteroposterior diameters of the eye bulb are slightly greater than the vertical diameter; the bulb in women is usually smaller than the bulb in men. Eye movement is controlled by six muscles: the superior and inferior oblique muscles and the superior, inferior, medial, and lateral rectus muscles. Also called bulbus oculi, eyeball. 1. 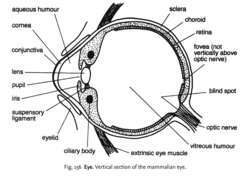 The organ of vision that consists of the eyeball and the optic nerve. The eyeball has three layers: the inner retina, which contains the photoreceptors; the middle uvea (choroid, ciliary body, and iris); and the outer sclera, which includes the transparent cornea. The eyeball contains two cavities: the anterior cavity and the posterior cavity. The smaller anterior cavity is in front of the lens and is further divided by the iris into an anterior chamber, filled with aqueous humor, and a posterior chamber, filled with the vitreous. Behind the lens is the larger posterior cavity, which contains the vitreous. The lens is behind the iris, held in place by the ciliary body and suspensory ligaments called zonules. The visible portion of the sclera is covered by the conjunctiva. Six extrinsic muscles move the eyeball: the superior, inferior, medial, and lateral rectus muscles, and the superior and inferior oblique muscles. Nerve supply: The optic (second cranial) nerve contains the fibers from the retina. The eye muscles are supplied by the oculomotor, trochlear, and abducens (third, fourth, and sixth cranial) nerves. The lid muscles are supplied by the facial nerve to the orbicularis oculi and the oculomotor nerve to the levator palpebrae. Sensory fibers to the orbit are furnished by ophthalmic and maxillary fibers of the fifth cranial (trigeminal) nerve. Sympathetic postganglionic fibers originate in the carotid plexus, their cell bodies lying in the superior cervical ganglion. They supply the dilator muscle of the iris. Parasympathetic fibers from the ciliary ganglion pass to the lacrimal gland, ciliary muscle, and constrictor muscles of the iris. Light entering the eye passes through the cornea, then through the pupil, and on through the crystalline lens and the vitreous to the retina. The cornea, aqueous humor, lens, and vitreous are the refracting media of the eye. Changes in the curvature of the lens are brought about by its elasticity and by contraction of the ciliary muscle. These changes focus light rays on the retina, thereby stimulating the rods and cones. The rods detect light, and the cones detect colors in the visible spectrum. The visual area of the cerebral cortex, located in the occipital lobe, registers them as visual sensations. The amount of light entering the eye is regulated by the iris; its constrictor and dilator muscles change the size of the pupil in response to varying amounts of light. The eye can distinguish nearly 8 million differences in color. As the eye ages, objects appear greener. The principal aspects of vision are color sense, light sense, movement, and form sense. When injury to the eye occurs, visual acuity is assessed immediately. If the globe has been penetrated, a suitable eye shield, not an eye patch, is applied. A penetrating foreign body should not be removed. All medications, esp. corticosteroids, are withheld until the patient has been seen by an ophthalmologist. The patient is assessed for pain and tenderness, redness and discharge, itching, photophobia, increased tearing, blinking, and visual blurring. When any prescribed topical eye medications (drops, ointments, or solutions) are administered, the health care provider should wash his or her hands thoroughly before administering the agent. The patient's head is turned slightly toward the affected eye; his or her cooperation is necessary to keep the eye wide open. Drops are instilled in the conjunctival sac (not on the orb), and pressure is applied to the lacrimal apparatus in the inner canthus if it is necessary to prevent systemic absorption. Ointments are applied along the palpebral border from the inner to the outer canthus, and solutions are instilled from the inner to the outer canthus. Touching the dropper or tip of the medication container to the eye should be avoided, and hands should be washed immediately after the procedure. Corticosteroids should not be administered topically or systemically until the patient has been seen by a physician, preferably an ophthalmologist. A prosthesis for placement in the orbit of an person whose eye has been removed. Bruising, discoloration, and swelling of the eyelid and tissue around the eye due to trauma. Application of ice packs during the first 24 hr will inhibit swelling. Hot compresses after the first day may aid absorption of the fluids that produce discoloration. Ocular irritation in a contact lens wearer, e.g. from bacterial infection or from an allergic reaction to a contaminant absorbed or entrapped by the lens. An eye that has become adjusted for viewing objects in dim light; one adapted for scotopic, or rod, vision. Dark adaptation depends on the regeneration of rhodopsin, the light-sensitive glycoprotein in the rods of the eye. The eye to which a person unconsciously gives preference as a source of stimuli for visual sensations. The dominant eye is usually used in sighting down a gun or looking through a monocular microscope. In sympathetic ophthalmia, the damaged eye, the source of sympathogenic influences. In strabismus, the eye directed toward the object of vision. An eye that has become adjusted to viewing objects in bright light; one adapted for phototic, or cone, vision. In this type of eye, most rhodopsin has broken down. An eye that deviates from the object of fixation in strabismus. In sympathetic ophthalmia, the uninjured eye, which reacts to the pathological process in the injured eye. Fig. 156 Eye , Vertical section of the mammalian eye. the light-receptor organ of animals. Such organs range in complexity from the single-lensed ocellus found in insects and some other invertebrates, to the vertebrate eye. The vertebrate eye consists of three layers (see Fig. 156 ). The fibrous outer coat consists of the SCLERA and the transparent CORNEA; the middle vascular layer is made up of the CHOROID, the CILIARY BODY and the IRIS; and the RETINA is the inner sensory layer. The two outer layers of the eye serve to support the retina or to focus images of the visual world on the retina. Light enters the eye through the cornea and is refracted through the AQUEOUS HUMOUR on to the lens. The shape of the lens can be altered (see ACCOMMODATION) to focus the light through the VITREOUS HUMOUR on to the retina, where light-receptive ROD CELLS and CONE CELLS (see FOVEA) convert light energy to nerve impulses which pass to the brain via the optic nerve (see BLIND SPOT). An inherited dysfunction of cone cells in some individuals, more common in males than females, can lead to the inability to distinguish between different colours, a condition known as COLOUR BLINDNESS. The position of the eyes at the front of the head provides BINOCULAR VISION, and movement of the eyes within the ORBIT is controlled by extrinsic eye muscles. Several accessory structures, namely the eyelids, LACHRYMAL GLANDS and CONJUNCTIVA, protect the eye from external damage. The peripheral organ of vision, in which an optical image of the external world is produced and transformed into nerve impulses. It is a spheroidal body approximately 24 mm in diameter with the segment of a smaller sphere (of about 8 mm radius), the cornea, in front. It consists of an external coat of fibrous tissue, the sclera and transparent cornea; a middle vascular coat, comprising the iris, the ciliary body and the choroid; and an internal coat, the retina, which includes the cones and rods photoreceptors. Within the eye, there are the aqueous humour located between the cornea and the crystalline lens, the crystalline lens held by the zonule of Zinn and the vitreous body located between the crystalline lens and the retina. The movements of the eye are directed by six extraocular muscles (Fig. E9). Syn. organ of sight; visual organ. amblyopic eye An eye which has amblyopia. Syn. lazy eye (colloquial). aphakic eye An eye without the crystalline lens. artificial eye A prosthesis made of glass or plastic which resembles the eye and which is placed in the socket after enucleation. See ocularist; ocular prosthesis. axial length of the eye See axial length of the eye. eye bank An organization that collects, evaluates, stores and distributes eyes from donors. The eyes are used for corneal transplants and research. See keratoplasty. black eye A colloquial term for a swollen or blue-black spot on the skin of the eyelid caused by effusion of blood as a result of a superficial injury in which the skin is not broken. The correct term is ecchymosis of the eyelid. The condition recovers by itself within 2-3 weeks while changing in colour to yellow. Immediately after the injury, application of ice helps minimize the haemorrhage and swelling. See haematoma. bleary eye A red and watery eye, with a lacklustre appearance. Lack of sleep is a common cause. Syn. blear eye.e. blink See blink. compound eye The eye of arthropods composed of a variable number of ommatidia. See corneal facet; ommatidium. crossed eye's See convergent strabismus. cyclopean eye Imaginary eye located at a point midway between the two eyes. When the two visual fields overlap and the impressions from the two eyes are combined into a single impression, the apparent direction of a fixated object appears in a direction that emanates from the cyclopean eye. dark-adapted eye An eye that has been in darkness and is sensitive to low illumination. Syn. scotopic eye. deviating eye The non-fixating eye in strabismus or under heterophoria testing. Syn. squinting eye. dominant eye The eye that is dominant when ocular dominance exists. See manoptoscope; hole in the card test. dry eye This term encompasses various tear film disorders ranging from a mild form causing discomfort, which is usually relieved with artificial tears, to the most common form keratoconjunctivitis sicca. See keratoconjunctivitis sicca. equatorial plane of the eye See equatorial plane. exciting eye See sympathetic ophthalmia. fixating eye The eye that is directed towards the object of regard in strabismus. See deviating eye. glass eye An artificial eye made of glass. See ocularist; ocular prosthesis. eye impression See eye impression. lazy eye See amblyopic eye. light-adapted eye An eye that has been exposed to light and is insensitive to low illumination. Syn. photopic eye. See light adaptation; duplicity theory. eye movements See eye movements. eye patch A piece of material or plastic that is worn over the eye when it has been injured or over the socket when it is missing. phakic eye An eye that contains the crystalline lens. See phakic. photopic eye See light-adapted eye. pink eye See contagious conjunctivitis. eye position Position of the eye in the orbit, maintained by the extraocular muscles. See primary position; secondary position; tertiary position. pseudophakic eye An eye fitted with an intraocular lens implant. See intraocular lens. red eye A colloquial term often used for any condition in which the blood vessels of the conjunctiva or ciliary body are congested. Many conditions result in a red eye (e.g. subconjunctival haemorrhage, pterygium, conjunctivitis, episcleritis, corneal abrasion, corneal erosion, ulcerative keratitis, corneal dendritic ulcer, acute iritis, angle-closure glaucoma, orbital cellulitis, and possibly contact lens wear). See ciliary injection; con-junctival injection. reduced eye A mathematical model of the optical system of the eye. It consists of a single refracting surface with one nodal point, one principal point and one index of refraction. In the first such model, proposed by Listing in 1853, the refracting surface had a power of 68.3 D and was situated 2.34 mm behind the schematic eye's cornea. It had an index of refraction of 1.35, a radius of curvature of 5.124 mm and a length of 20 mm. Donders' reduced eye was even more simplified. It has a power of 66.7 D, a radius of curvature of 5 mm, an index of refraction of 4/3 and anterior and posterior focal lengths of −15 and +20 mm, respectively, with a refracting surface situated 2 mm behind the schematic eye's cornea. Gullstrand's reduced eye has a radius of curvature of 5.7 mm, an index of refraction of 1.33, a power of 61 D with the refracting surface situated 1.35 mm behind the schematic eye's cornea. Emsley's reduced eye has a power of 60 D, an index of refraction of 4/3 and is situated 1.66 mm behind the schematic eye's cornea, with anterior and posterior focal lengths of −16.67 and +22.22 mm, respectively. schematic eye A model consisting of various spherical surfaces representing the optical system of a normal eye based on the average dimensions (called the constants of the eye) of the human eye. There are many schematic eyes, although the most commonly used is that of Gullstrand. A great deal of variation among authors stemmed from the difficulty in giving an index of refraction that would represent the heterogeneous character of the crystalline lens. Gullstrand in fact proposed two schematic eyes, one which he called the exact schematic eye and the other which he called the simplified schematic eye in which the divergent effect of the posterior corneal surface is ignored and the cornea replaced by an equivalent surface; the crystalline lens is homogeneous and the optical system is free from aberrations. scotopic eye See dark-adapted eye. eye shield 1. See occluder. 2. A protective device to cover the eye against injury, glare or in radiotherapy of the face. sighting-dominant eye The eye that is preferred in monocular tasks, such as looking through a telescope or aiming a firearm. eye socket The bony orbit which contains the eyeball, the muscles, the nerves, the vessels, the orbital fat and the orbital portion of the lacrimal gland. eye speculum An instrument designed to hold the eyelids apart during surgery. Syn. blepharostat. squinting eye See deviating eye. eye stone A small, smooth shell or other object that can be inserted beneath the eyelid to facilitate the removal of a foreign body from the eye. sympathetic eye The uninjured eye in sympathetic ophthalmia that becomes secondarily affected. Syn. sympathizing eye. wall eye A colloquial term referring to (1) a white opaque cornea or (2) a divergent strabismus. 2. Area of eye, including lids and other accessory organs; contents of orbit (common). n one of a pair of organs of sight, contained in a bony orbit at the front of the skull. n an examination of the eyes–which includes an observation of pupil size, sclera color, the relative location of the eyeball, and use of corrective eyeware–to determine the presence of disease. n See plane, Frankfort horizontal. the organ of vision. In the embryo the eye develops as a direct extension of the brain, and thus is a very delicate organ. To protect the eye the bones of the skull are shaped so that an orbital cavity protects the dorsal aspect of each eyeball. In addition, the conjunctival sac covers the front of the eyeball and lines the upper and lower eyelids. Tears from the lacrimal duct constantly wash the eye to remove foreign objects, and the lids and eyelashes aid in protecting the front of the eye. The eyeball has three coats. The cornea is the clear transparent layer on the front of the eyeball. It is a continuation of the sclera (the white of the eye), the tough outer coat that helps protect the delicate mechanism of the eye. The choroid is the middle layer and contains blood vessels. 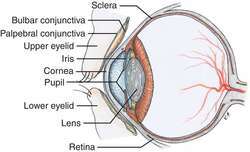 The third layer, the retina, contains rods and cones, which are specialized cells that are sensitive to light. Behind the cornea and in front of the lens is the iris, the circular pigmented band around the pupil. The iris works much like the diaphragm in a camera, widening or narrowing the pupil to adjust to different light conditions. include orbital fascia, ocular muscles, eyelids, tunica conjunctiva, lacrimal apparatus and, in the pig, the orbital ligament. observed with dehydration in birds, where the eyeball is sunken, particularly in raptors which normally have a prominent, round globe. a common term for corneal edema. See also blue eye. common lay term for ocular squamous cell carcinoma. one with a blue iris. seen in dogs with sunken eyes and loose skin in the eyelids which drop inwards, such as St. Bernards and Newfoundland. Often contributes to entropion. vestibular nerve lesion will cause the eye on the affected side to deviate downward more than the opposite eye when the head is lifted. permanent protrusion of the lower conjunctival sac; thought to be inherited in some breeds of guinea pigs. term for congenital cataracts in guinea pigs. an eye showing dilation of conjunctival, episcleral or ciliary blood vessels. includes eye preservation (menace), pupillary light, consensual light reflexes. the irregular distribution of melanin in a blue iris. Seen commonly in dogs with merle coat color and Siberian huskies. Called also heterochromia iridis. In humans, the term refers to exotropia, or divergent strabismus. See also walleye. various medicated solutions used to flush the eye; called also collyria. one with an iris containing blue and yellow or brown pigment. an estimate of the startle response and an indicator of fear in dairy cattle. congenital cataract associated with congenital bluetongue infection in calves. Q. How to get rid of puffy eyes? After partying all night, I woke up with puffy eyes. I have an important appointment today, how can I get rid of it? Q. What Causes Dry Eyes? I have been suffering from eye dryness lately, what causes this situation? A. Dry eyes are often caused when the lacrimal gland does not produce sufficient tears to keep the entire conjunctiva and cornea, that are normally covered by a complete layer of tear film. This usually occurs in people who are otherwise healthy. Increased age is associated with decreased tearing. if it causes you real discomfort talk to a doctor.